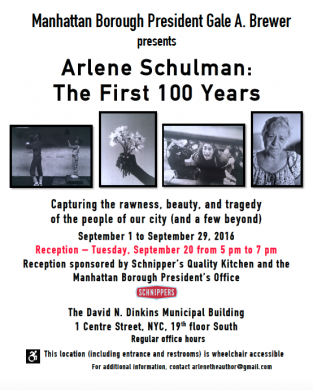 Reception Tuesday September 20 at The David N. Dinkins Municipal Building, 5 pm to 7 pm. On view through September 29. Bronx-born Arlene Schulman has had a robust career as a photographer, with an array of published books, including the award-winning The Prizefighters: An Intimate Look at Champions and Contenders. Her photos reflect a lifetime living in the city, and I mean lifetime: she started taking photos when she was a mere eight years old. They focus on the everyday and the working class, portraying subjects like police officers and boxers in large-format prints. And photography isn’t all she does– she also writes, edits, and teaches. This exhibit, presented by Manhattan BP Gale A. Brewer, seeks to showcase her large body of work and the unique way she sees the city. But careful, don’t go offering her the chance to shoot artful pictures of any lima beans or olives—she writes on her website that she hates those.